France's submission for Best Foreign Language Film at this year's Oscars is quite possibly the most true life and honest movie you'll ever see about teaching and the high school learning experience. And this may have to do with the movie being based off an autobiographical novel by a teacher, Francois Begaudeau, who plays himself in the movie. The cast consists of a group of non-actors portraying students, a replication of Begaudeau's class, each playing characters who could very well be just themselves. Here's a film so convincing that it could be mistaken for a documentary. It plunges us in the center of this school, and we immediately become a part of it. In intimately close scenes within the classroom itself, each and every moment suggests more than it tells creating gripping entertainment. Like most French films, there's no clear-cut Hollywood ending and no real plot that emerges until about halfway through. And yet, that's exactly the point in that there sometimes are no real satisfying resolutions to be found, especially when it comes to high school. "The Class" is nothing short of perfect. 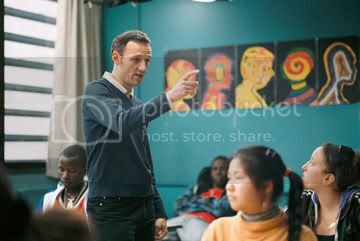 Mr. Marin (Francois Begaudeau) teaches French in an inner-city school in Paris that is diverse and acts as a mini sampling of France's culture. The school is known for having some lower-income and troublesome kids, but as we get to know them, I think that's the last word fit for describing them. It's not that these kids aren't intelligent, but more so, they're frustrated learning in a society that may not provide any opportunity for them. They're rebellious and talk back but only because they're smart enough to question. The class is full of different ethnicities of 14- and 15-year-olds, each of whom have very distinct and memorable personalities. Within Mr. Marin's class, they're attempting to learn the formal structure of French, meanwhile they're all speaking their own variation of the language full of slang. It's the irritating lessons of the imperfect subjunctive that formulates the most grief. The key players include an Arab girl, Esmeralda, who tends to be outspoken and resentful and Souleymane, an African boy who you can tell is intelligent but just doesn't try very hard perhaps for his own personal reasons. He also gets angry easily. Then there's Wei, an Asian boy, who is extremely intelligent but has learned to keep a low profile perhaps due to his own parents' predicament. Other students within the classroom are friends, cohorts, and enemies of these students. And then there are some students who you see but never hear from. In the case of one girl, she doesn't speak up until the end of the school year in a heartbreakingly sincere moment with Mr. Marin. The real-time classroom scenes boil with exuberance, life, energy, and bits of rage. These scenes are hectically kinetic and reveal the essence of teaching, that is the back-and-forth negotiating and battling teachers have to do. Mr. Marin works moment by moment, trying to level with his students while still keeping authority, a tough balancing act that is brilliantly presented here. The revelation is in the fact that the kids are allowed to talk. Not only the classroom scenes but also the aerial scenes of the students outside during their break reveal much of what they're going through. All of their mental frustrations are acted out here sometimes in physical contact, but more often than not, just in verbal put-downs which sometimes bleed over into the classroom. There's also faculty interaction that we eavesdrop on, and these discussions reveal not only some imperfections in the education system but also the challenging intricacies there are in dealing with the power struggle and limitations between teacher and student. Some difficult moral ground is breached upon in these conversations. Mr. Marin also has to face parent-teacher conferences where he confronts the students' real-life parents simply playing themselves, which yet again adds to the unflinching realism of it all. Directed by Laurent Cantet, "The Class" cruises through an entire school year full of joy, laughter, pain, and turmoil in a surprisingly quick 128-minute running time. It's an ultimately unassuming film that creates great drama and intrigue out of seemingly separate and light conflicts. And yet, these are smaller incidents that fit into a larger scheme of things in focusing on the struggles of the schooling system not only in France but all parts of the world. The same issues we see here would be similar issues that crop up in a Western inner-city school. We've seen it done in American films before but never to this level of expertise. There's a closing shot of "The Class" that sums it up pretty well. What exactly remains after an entire school year of teaching and learning? What's left except for an excitement and longing for what's next to come?